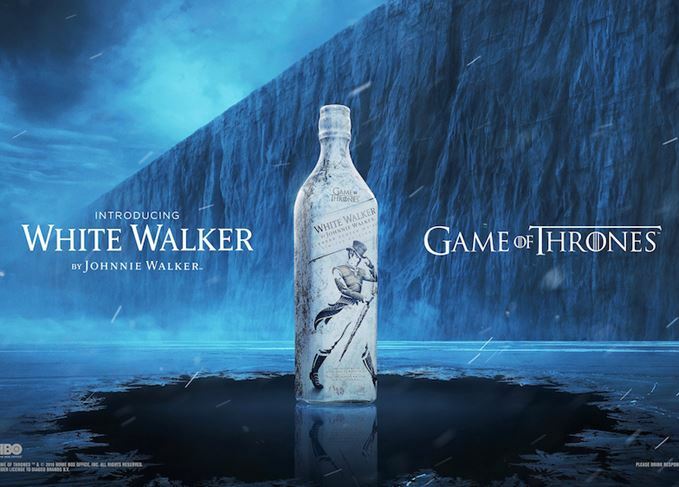 Johnnie Walker has confirmed details of its White Walker release, a blended whisky produced in collaboration with cult television series Game of Thrones. The limited-edition product, which was teased earlier this year, is said to have been inspired by the White Walkers, the show’s ‘most enigmatic and feared characters’, and will be released this month as Game of Thrones nears its final season. Best served from the freezer, White Walker is designed to evoke the ‘chilling presence’ of the White Walkers, an undead army from the Frozen North, led by the Night King. Created by blender George Harper and the Johnnie Walker team, the whisky uses single malts from Cardhu and Clynelish in the blend, and is said to have ‘notes of caramelised sugar and vanilla, fresh red berries with a touch of orchard fruit’. The White Walker bottle has an ‘icy’ white and blue design, featuring the Johnnie Walker striding man clad in armour. When brought out of the freezer, the bottle has ‘an unexpected graphic icy reveal’, designed to remind GoT fans that ‘Winter is Here’. As part of a wider partnership with Game of Thrones production company HBO, Diageo will also launch the Game of Thrones Single Malt Scotch Whisky Collection in February 2019, featuring eight whiskies, each paired with one of the Houses of Westeros and the Night’s Watch. The single malts will reportedly include a no age statement (NAS) Cardhu Gold Reserve House Targaryen, a 9-year-old Lagavulin House Lannister, a House Stark Winter's Frost from Dalwhinnie and a 12-year-old Royal Lochnagar House Baratheon, with more details to follow. White Walker by Johnnie Walker will be available globally from this month, bottled at 41.7% abv and priced at US$36 for a 750ml bottle. Eight single malts inspired by the fantasy series are now available for pre-order in Europe.